This PDF 1.3 document has been generated by Microsoft Word / Mac OS X 10.6.8 Quartz PDFContext, and has been sent on pdf-archive.com on 03/03/2015 at 10:49, from IP address 2.230.x.x. The current document download page has been viewed 621 times. File size: 2.3 MB (3 pages). are	repeated	from	one	generation	to	the	next. ancestors	on	the	construction	of	personality. 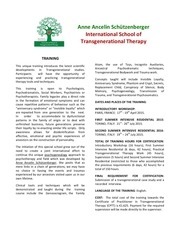 Transgenerational	Bodywork	and	Trauma	work. 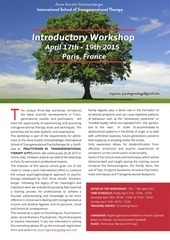 PARIS,	FRANCE:	17th	-­‐	19th	April	2015. TORINO,	ITALY:	21st	-­‐	26th	July	2015. TORINO,	ITALY:	19th	–	24th	July	2015. LANGUAGE	OF	THE	TRAINING:	English. supervision	will	be	made	directly	to	the	supervisor. France. She	was	trained	in	psychodrama	by	J.	L.
Lewin’s	group,	Leon	Festinger	and	Ronald	Lippitt. Trainer	in	PIfE-­‐Psychodrama	Institute	for	Europe. wisdom”,	transpersonal	therapy	and	more. Professor	at	the	Università	della	Valle	D'Aosta. transactionnelle. In	january	2010	in	AAT	revue. This file has been shared by a user of PDF Archive. Document ID: 00212328.